This coloured aquatint was made by Robert Havell and Son from plate 18 of JB Fraser's 'Views in the Himala Mountains'. 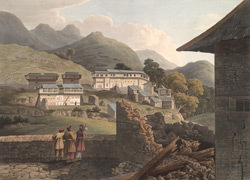 The Fraser brothers came upon many villages as they moved across the Himalayan foothills. Many were poor or in a state of desolation because of the depredations of war. James Fraser described the little villages in detail in his journal: "Flat-roofed, built of stone and with wooden beams supporting a terrace of stone and wood. Some are of two stories ... They are very rudely constructed; frequently the side of the hill serves for one of the walls ... The doors are uncommonly small ... But with all this rudeness, I have been astonished to see the neatness within doors."